When I started this blog I was pretty confident that I wouldn’t run out of recipe ideas and that the writing would flow (occasional writers block excluded). But I was worried about the photography. I used the camera for holidays, parties, kids being cute….mainly people pics; not food photography (unless involving chocolate being smeared across a face or a birthday cake). Snapping shots of food for the blog was totally new to me and a bit scary. But it’s been a year and I think I’m holding my own and slowly improving. Yet I still find it annoying when amidst cooking, hands covered with ____ (insert whatever I’m working with at the time…flour, brown sugar, pork shoulder, etc.) I have to remember to stop, wash my hands, pick up my camera and take photos. Must make sure nothing offensive ends up in the shot (dirty paper towel, scrubby sponge, half-full glass of water). And now that it’s fall and the days are getting shorter I have to remember to time my cooking and photography while there’s still natural light available. For this week’s Pulled Pork Sandwiches I was on my A-game. Got my shots of the rub, the onions, the pork before going in the oven, pork coming out of the oven and the final shot – served up on a bun with coleslaw, pickles and hot sauce. But somewhere between all that I completely forgot to shoot the shredding of the pork, which is a pretty important step. It is called “pulled” pork after all. It reminds me that life isn’t perfect, cooking isn’t perfect and not to take things too seriously. Especially with a fun, southern-style recipe like this. It’s my favorite when we have out-of-town guests (which has been a lot of late…between October and November we have overnight guests 35 days!!). I make up a batch and it sits in the fridge all weekend for an easy meal or snack. Plus any leftovers freeze beautifully. Life might not be perfect, or cooking, but the taste of these pulled pork sandwiches is pretty close to perfection…complete set of photos or not. Note: If pork shoulder in your region comes with a fat layer (crackling), as it does in the UK, the pork should weigh a bit more than indicated in the recipe (2.5-3 kg rather than 2-2.5 kg). Remove all but a thin layer of the fat before proceeding with the recipe. If you want to turn the fat layer into crackling – and who wouldn’t? – see “crackling” instructions at the end of the recipe. Also, this recipe is a bit spicy (there’s cayenne pepper and red pepper flakes). If you are concerned about it being too spicy, especially for kids, omit those spices and just use more hot sauce when you serve the sandwiches. 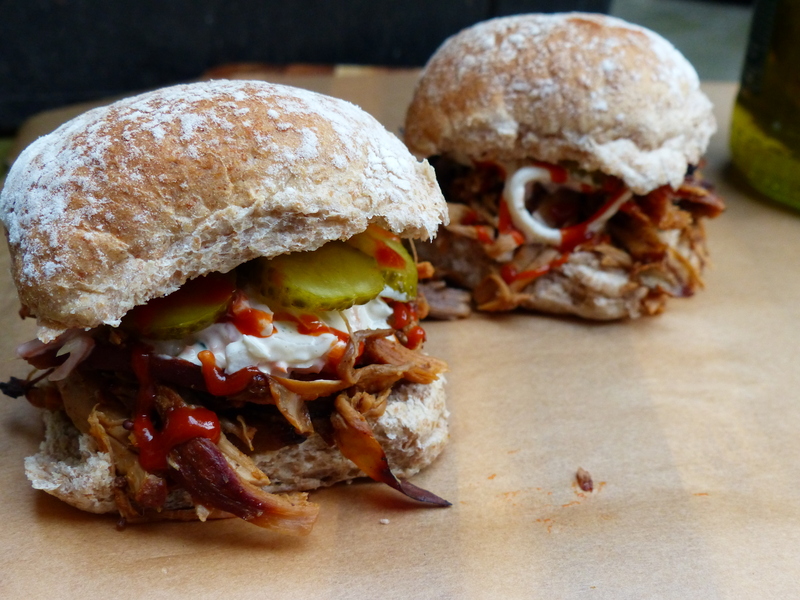 I love my pulled pork sandwiches with Sriracha sauce. Preheat the oven to 425º F (220º C). Line a medium roasting pan (e.g. 9 x 13 inch or 23 x 33 cm) with sheets of foil big enough to fold over the top of the pork. Rub the pork with salt and pepper. Combine the paprika and brown sugar in a small bowl and rub it all over the pork. Place the pork in the pan. Scatter the onions around the pork. Put pan in the oven, uncovered, and cook for 30 minutes. Take pan out of the oven, reduce heat to 250º F (125º C) and seal the pork in the foil. Return to the oven and cook another 6-7 hours, until the internal temperature is 190º F (90º C) and the ends of the pork easily pull apart with a fork. Remove pan from oven and let rest until cool enough to handle. Increase heat to 350º F (175º C). While pork is resting, prepare the sauce. Combine all the ingredients (cider vinegar through cayenne pepper) and mix together well. Transfer pork onto a cutting board. Discard any fat or liquid from the roasting pan; discard the foil. Shred pork with two forks or your fingers, discarding any fat or connective tissue. Thinly slice the onions. Place shredded pork and sliced onions back in the pan. Stir in the sauce, season to taste with salt and pepper. Place in oven, uncovered, and cook for 30 minutes until top layer is crispy. Serve on warm rolls topped with coleslaw, sliced pickles /gherkins and hot sauce. Pulled pork will keep in the refrigerator for about 3 days. Can be kept frozen for up to 2 months. Crackling instructions: Score the fat with a heavy knife (utility knife works best or buy pork with a pre-scored rind). Preheat oven to 425º F (220º C). Place fat, scored-side up, on a sheet pan and roast for 40-50 minutes until rind is golden and crisp. Cut into strips with a knife or kitchen scissors. Happy day after Thanksgiving!! Before I forget, if you find yourself post-Thanksgiving with an abundance of cranberries that didn’t make it into the sauce, you must bake these Cranberry-Pecan Muffins from Cooks Illustrated. They’re seriously the best muffins I’ve ever made. The toasted pecans are so good and with the tart cranberry and a streusel topping – yum!! Now back to the post at-hand. Everyone should have at least one go-to, easy, healthy, delicious weeknight meal that they could make over and over again and still not tire of. 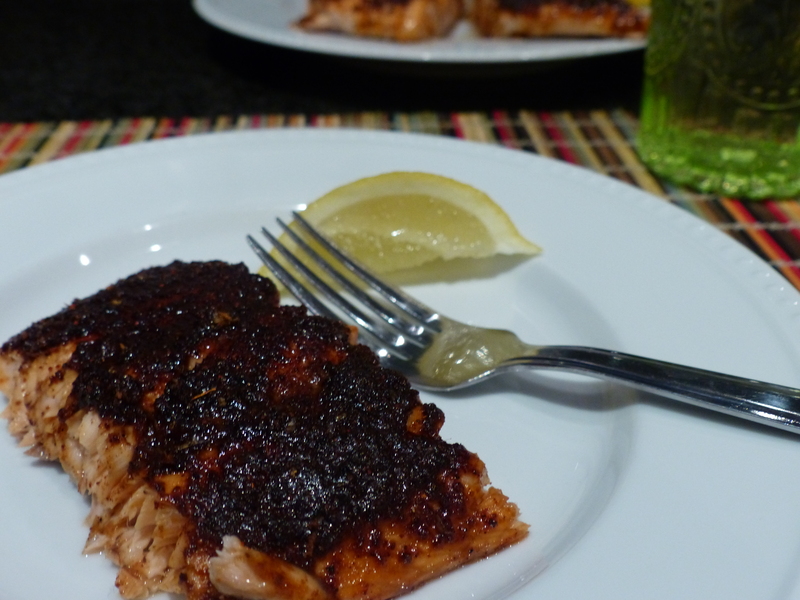 Barbecued Roasted Salmon is mine. Since discovering it in the pages of Cooking Light magazine over 10 years ago (oh, how back in the day I anxiously awaited its monthly arrival!) it’s been in my regular weeknight dinner repertoire. Salmon can be dry, but marinating it for an hour in pineapple juice and lemon juice keeps it moist. Another tip is to take it out of the oven when there is still a bit of dark pink in the center – that will keep it from tasting too dry as well. So fire up your oven….just because it’s getting cold outside and grills are being retired, doesn’t mean you can’t enjoy the taste of BBQ. Combine pineapple juice, lemon juice and salmon in a large zip-lock bag. Seal and marinate in the refrigerator for 1 hour, turning occasionally. Preheat oven to 400º F (200º C). Lightly grease a medium roasting pan (e.g. 9”x13” or 23cm x 33cm pan). Combine lemon zest, brown sugar, chili powder, cumin, salt and cinnamon) in a small bowl. After 1 hour, remove fish from bag and discard marinade. Place fish in the roasting pan and rub the top of the fish with the brown sugar mixture. If fish is of uneven thickness, tuck any thin ends under to ensure even baking. Bake for 12 minutes or until almost cooked in the center at the thickest part. The center will be firm with just a line of uncooked salmon in the very center. (I peek by inserting the tip of a small knife. Alternately you can use a thermometer and cook until it reaches an internal temperature of 130º F (55º C)). If using a single, large filet, cut into 4 individual servings. Remove any skin off the bottom and serve.